Saracens will play their on Saturday 6 April at Twickenham. Sarries had initially suggested they would play the game at their new Allianz Park stadium. But that would have required temporary permission to increase the ground's capacity from 10,000 to 15,000. "It is absolutely clear that people want to see big teams playing big matches at big stadiums," said Sarries chairman Nigel Wray. "And that is precisely what we will deliver at Twickenham. "We look forward to playing this important match at the home of English rugby, a ground that many of our players know extremely well. "We did consider the option of playing this showpiece match at Allianz Park, our brand new home stadium in NW4, but, in consultation with local residents and our partners at the London Borough of Barnet, we have decided to settle at the new venue before applying to stage a one-off event with a larger capacity." 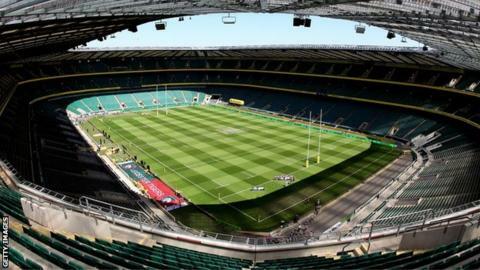 It will be the first Heineken Cup quarter-final played at Twickenham, English rugby's headquarters. European Rugby Cup rules state that Heineken Cup knock-out games must be played at an arena with at least a 15,000-person capacity. Saracens opened Allianz Park last week with an LV= Cup victory over Cardiff, after almost 16 years of groundsharing at Watford's football stadium, Vicarage Road. But the 2011 Premiership winners have actively pursued different options for hosting games, having used Wembley, MK Dons' Stadium MK, Bedford Blues' Goldington Road ground and King Baudouin Stadium in Belgium in the past. Attempts to play matches in Cape Town and New York have previously fallen through. Saracens beat Harlequins in a regular season game at Twickenham in December 2011 and went on to lift their maiden Premiership title there the same season.